^ CIA – The World Factbook – Mauritania. [7 November 2010]. 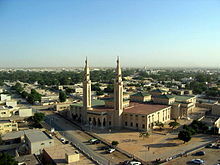 ^ 2.0 2.1 2.2 2.3 Mauritania. World Economic Outlook Database. International Monetary Fund (IMF). April 2016 [2016-06-21]. ^ 驻毛塔大使武东拜会毛新任司法部长达达赫. 中华人民共和国驻毛里塔尼亚伊斯兰共和国大使馆. [2015-06-20]. （原始内容存档于2015-06-20）.